My samples are piling up, so I thought I would get them organized and start making a concerted effort to start using them up and reviewing them as I go. Between all of the samples I receive from Sephora orders, their deluxe sized samples that are often ordered with codes, samples that come with Macy's and Bloomingdale's orders...let's just say I have a lot of samples! They're now all neatly organized in a pretty glass container in the bathroom, and I encourage people to take what they'd like when they come over to visit. Of course if I'd quit ordering beauty products, my samples would deplete themselves over time, but what fun would that be? I do enjoy receiving various samples though, because I've found some great products this way. I've also been able to reject the idea of purchasing a full sized product, by realizing that a particular product that I sampled first, just didn't work for me. 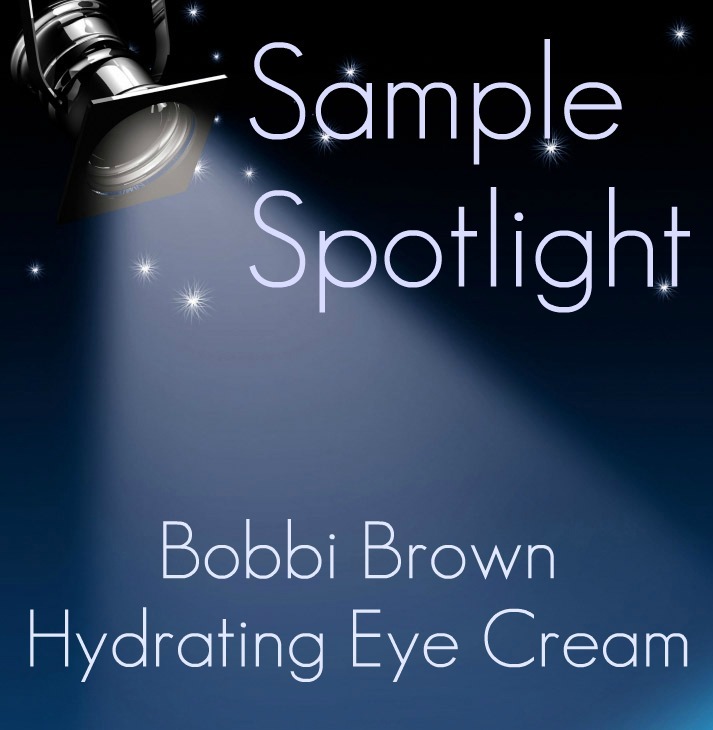 My first Sample Spotlight will focus on Bobbi Brown's Hydrating Eye Cream, which I received from Sephora a while back using one of their deluxe code offers. Bobbi Brown's Hydrating Eye Cream is a rich white cream that has little if any scent. The texture is of medium consistency, and it applies very smoothly with quick absorption. I just use a small amount on my finger tip for each eye, and I feel that a little of this product goes a long way. This product feels very nice going on--it's silky smooth and non-greasy. 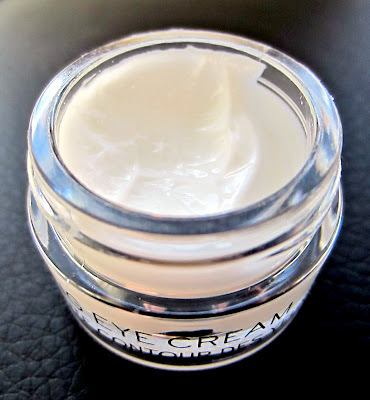 This is primarily a hydrating eye cream that also sets the stage for a smooth canvas for your concealer. It doesn't promise to remove wrinkles, puffiness, or dark circles, although hydration alone can often help to alleviate those issues. It is very hydrating, and the area around my eyes continues to look soft and moisturized all day long. The photo above is of the full-sized product from Bobbi Brown's web site. Below is my sample jar that hopefully gives you an idea of the texture. Here is a look at the official product description, followed by the ingredients. This quick-absorbing eye cream delivers naturally-occurring humectants that melt into the skin, leaving the eye area soft, smooth and refreshed for up to 24 hours. A perfect level of emollients imparts a lightweight texture, allowing concealer to glide on evenly - Aloe Vera and Witch Hazel Extract soothe and comfort; Jojoba Seed, Avocado Oil and Squalane condition and revive continuously. Ingredients: water, ethylhexyl palmitate, squalane, butylene glycol, cetyl alcohol, glyceryl stearate, hydrogenated vegetable oil, simmondsia chinensis (jojoba) seed oil, persea gratissima (avocado) oil, hamamelis virginiana (witch hazel) extract, aloe barbadensis leaf juice, retinyl palmitate, cholesterol, peg-100 stearate, glycerin, sodium pca, trehalose, ascorbyl palmitate, ethylhexylglycerin, hydroxyproline, proline, acrylates copolymer, phytantriol, glycine, linoleic acid, phytosphingosine, tocopheryl acetate, sodium hyaluronate, tocopherol, carbomer, sodium carbomer, disodium edta, phenoxyethanol. Usage: Apply with fingers, patting gently around eye area. Make sure cream is fully absorbed before applying concealer. My thoughts on this eye cream are favorable, although I am certain I won't be purchasing the full-sized product. I've been using this faithfully for almost 3 weeks now, and other than my eye area feeling and looking hydrated, I'm not seeing too much improvement in fine lines and dark circle reduction. It delivers hydration as promised, it didn't irritate my eye area at all, it feels soothing and moisturizing well into the night, and it does make my eye area look better. However, my eye area doesn't look significantly improved using this product any more than it does using many other lower priced products. Again, this product doesn't claim to address all of my eye concerns, but I had read a number of reviews that claimed dark circles were erased, their fine lines had lessened, and that sort of thing. This product was of interest to me because of several reviews, so I'm glad I was able to sample it before spending my money on it. I'm always looking for a miracle eye product that will turn back the hands of time, and I've yet to find one that "does it all". 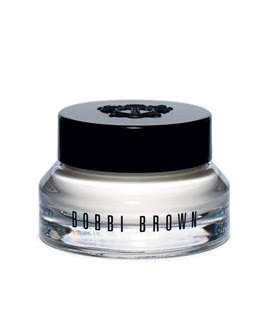 Many of them, including this product from Bobbi Brown, do a decent job improving my overall eye area. Does this eye cream do what it claims to do? Absolutely. However, if I'm going to spend $46.00 on any eye product, I want to see more results. This particular product is too expensive compared to the results I received. I would definitely spend more than $46.00 for an eye product, but I would need to see visible improvement in several areas of concern in order to warrant the cost.